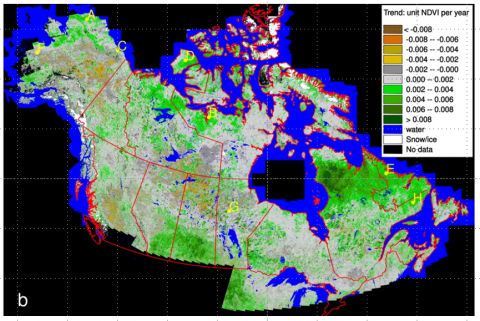 Apr 2, 2019 • The Arctic-Boreal Vulnerability Experiment (ABoVE) field campaign has released data of the summer NDVI trend and trend significance for 1984 to 2012 over Alaska and Canada. The NDVI were calculated per-pixel from all available peak-summer 30 m Landsat 5 and 7 surface reflectance data for a total of 87,762 Landsat scenes over 1,271 Path/Row locations. There are 1,020 data files in GeoTIFF (.tif) format, and the files provide the NDVI trend and NDVI trend significance in the ABoVE 30 m reference grid system. ABoVE is a NASA Terrestrial Ecology Program field campaign that will take place in Alaska and western Canada between 2016 and 2021. Research for ABoVE will link field-based, process-level studies with geospatial data products derived from airborne and satellite sensors, providing a foundation for improving the analysis, and modeling capabilities needed to understand and predict ecosystem responses and societal implications. See all data ORNL DAAC datasets from ABoVE.